Autodesk has released service packs for AutoCAD for Mac and AutoCAD LT for Mac that will make them both compatible with Apple’s latest version of OS X 10.8, a.k.a. Mountain Lion. This is great for any Mac user that has updated to Mountain Lion or has been waiting for Autodesk to update to Mountain Lion. Mountain Lion was available for download in July so this update to AutoCAD is a welcomed one. The service pack also addresses some bugs and other issues as well. The service packs are available for download but before you do, take a moment to see how you first installed your AutoCAD for Mac software. Evidently Apple has change their guidelines for OS X 10.8 regarding security. Essentially this means that you might not be able to perform a “fresh” install or re-install of your existing AutoCAD for Mac products. You may have to download the full version of AutoCAD for Mac. So the service packs might not work for you. Uninstall the current version, download the new full version and install those. The new versions have the service pack in them and meet Apple’s new guidelines. 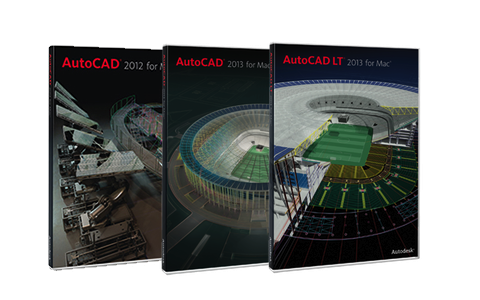 The AutoCAD 2013 LT for Mac service pack is not for the AutoCAD LT 2013 for Mac purchased from the Mac App Store. That version will get the new update directly when the App Store makes it available. That’s one of the reasons for purchasing apps through the store. If you haven’t received that update yet you will. For more information see Autodesk's blog "Without a Net". This is good to see this update. Many users have been waiting to update to Mountain Lion until the AutoCAD for Mac update was available. This update took about two and half months. I’m curious to see how long the Windows 8 update for AutoCAD will take? Hopefully it won’t take long.